We now provide our World Class Limousine Services to Top Golf in Edison, NJ. Get A Free Quote For Your Group Now! luxury limo service to top golf in edison. heading out for some golf fun? take one of our luxury limousines. Top Golf in Edison, NJ is quickly becoming a huge favorite of our clients. It combines competitive Golf with wining and dining that is raved about. Whether your celebrating a Birthday, Anniversary, Corporate Function, Bachelor/ette Party or just heading out for the evening with friends, read on to learn more about what makes us the perfect way to get there! the perfect way to get there. Travel together in one awesome vehicle - We have custom High Top Mercedes Limousines, Stretch Escalades and gorgeous Executive Shuttles, so no matter how big your group gets, you get there together! Save money - Split the cost amongst your group and save on transportation. We even offer special rates for our clients heading to Top Golf! Inquire by contacting us at (732) 210-9874 today! Get there and back safely - Our Chauffeurs are randomly drug tested, background checked and through and through professionals. Our vehicles are world class, comfortable and clean. You may not be Tiger or Phil, but you can certainly get around like them! Go in the lap of luxury! 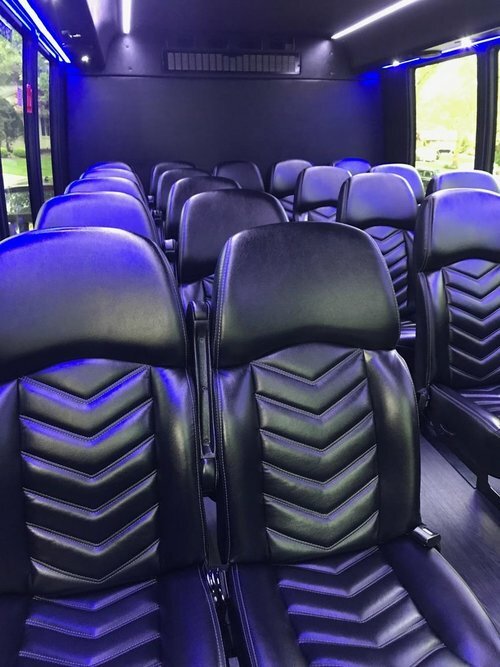 Take our Custom Sprinter Limousine that seats up to 11 for example. Why is it so much fun? Crank up a YouTube Karaoke channel on the dual flat panel displays and blast the mega watt sound system to find out! Keep your adult beverages cold in the wet bar and enjoy during the ride! It's made for this kind of thing! Bigger group? We have everything from 21 passenger mini-bus shuttles to full blown 56 passenger Coach buses!